In an exciting step forward to finding a cure for brain tumours, which kill more children and adults under the age of 40 than any other cancer, the national charity Brain Tumour Research brought together a group of leading brain tumour scientists and clinicians to help accelerate vital research into this devastating disease. A dozen researchers drawn from across the charity’s four Research Centres of Excellence – Imperial College Healthcare NHS Trust, Plymouth University, Queen Mary University of London (in partnership with UCL in London) and the University of Portsmouth – met at Lydiard House conference venue in Swindon at the end of May to each present the latest developments from their respective research programmes. 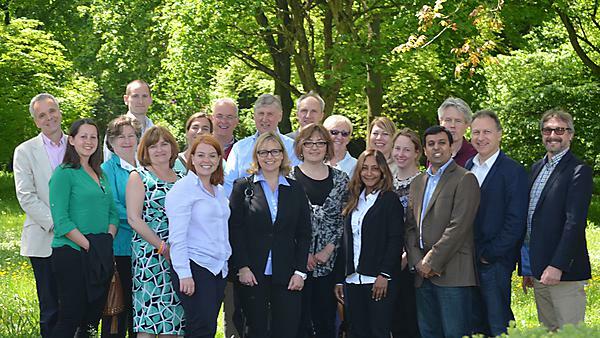 This ground-breaking workshop – the first of its kind in the UK organised by a brain tumour charity – was aimed at fostering pro-active partnerships between key research hubs. Sharing their insights, the team looked at developments in research for low and high-grade brain tumours, adult and paediatric brain tumours, and multi-pronged targeting of brain tumours by attacking mitochondria that control cancer cell growth and killing the stem cells that produce new cancer cells. Surgical advances were also revealed, including updates on the iKnife – a smart scalpel that can ‘sniff out’ cancer cells during surgery and provide real-time diagnostic information about the type of brain tumour being operated on. The scientists identified some distinct areas of prospective collaboration and interaction between the four centres to speed up the process of research translation from laboratory into clinical trials in order to provide better outcomes for brain tumour patients in future and to one day find a cure. These included developing new initiatives and procedures around biobanking, obtaining and sharing brain tumour tissue samples, equipment sharing, pathology support, and imaging technology. Everyone recognised the need for greater funding to fast-track research translation from laboratory to clinic and to combine efforts to combat glioblastoma multiforme (GBM), the most common and deadly form of brain tumour with very low survival rates. “This funding stream is enabling us to look at so many diverse areas of research. Repurposing drugs, new drug delivery systems, paediatric neuro-oncology, cancer metastases, the brain tumour micro-environment and a mitochondrial and metabolic approach to brain tumours.